A Disgruntled Republican in Nashville: Gov. Haslam proposes a tax cut on food and an increase in the Gas tax. Gov. 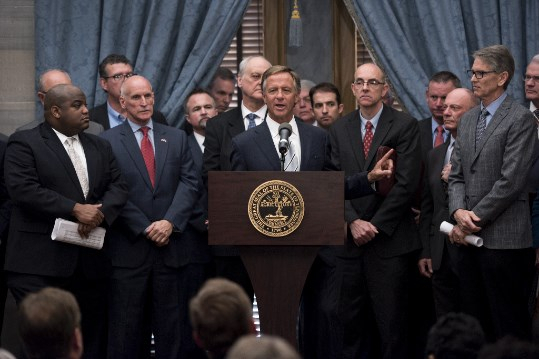 Haslam proposes a tax cut on food and an increase in the Gas tax. This morning I was joined by mayors from across the state and leaders in the manufacturing and trucking industries to announce the IMPROVE Act, a plan to cut taxes on food and manufacturing and update how the state provides Tennesseans the safe and reliable transportation network we need to support future job growth. -The legislation cuts $270 million annually in taxes, bringing the total number of cuts made and proposed since 2011 to $540 million annually, roughly nine times more than any other administration. -Working with the General Assembly, we have also cut $500 million in recurring costs out of the state budget since 2011. The IMPROVE Act cuts food and business taxes because we’ve reduced the cost of state government to taxpayers and we need to be strategic where we’re at a competitive disadvantage for recruiting jobs to Tennessee. -Tennessee last addressed how it funds its roads and bridges in 1989 when it raised its fixed tax rate to 21.4 cents per gallon, creating a transportation network that spurred the economic growth the state has seen during the last three decades. -Tennessee’s 21.4 cents per gallon flat gas tax is now worth 11 cents, according to the State Comptroller’s Office. -With a comprehensive and balanced transportation proposal, the IMPROVE Act keeps Tennessee a pay-as-you-go state and the state’s transportation network debt-free for the next generation at a cost to the average Tennessee road user of approximately $4 a month while delivering 962 projects across all 95 counties. The IMPROVE Act, “Improving Manufacturing, Public Roads and Opportunities for a Vibrant Economy,” is the first piece of my NextTennessee legislative plan, proposals aimed at building and sustaining economic growth and the state’s competitiveness for the next generation of Tennesseans. Because we are a smaller, less tax reliant state government, it is time to build on the vision of what the future of Tennessee looks like and requires. The IMPROVE Act is the next step in the conversation about how we’re going to address expected growth, maintain Tennessee’s economic momentum and remain competitive as we continue recruiting high quality jobs. Together these tax cuts and investments will move the state forward and position the next Tennessee for continued growth, prosperity and opportunity for our children and grandchildren.